(?) Eunis was also known as Eunis Brockway. George M. Evans was born on 28 August 1849 at Greene, Pennsylvania, USA.1 He married Anna Maria Denbow, daughter of James Denbow and Rebecca Rogers, on 13 March 1873 at Tyler, West Virginia, USA.1 George M. Evans married Eiza Jane Hickman in 1907.1 George M. Evans died on 21 March 1939 at Pennsylvania, USA, at age 89. Joseph David Evans was born on 7 August 1885 at Sistersville, Tyler, West Virginia, USA. Otho Clinton Evans was born in January 1906.2 He died in August 1960 at age 54. Paul Evans was born on 28 June 1910. He died on 22 June 1966 at age 55. (?) Eve was born on 4 September 1814. She Age at death: 73 years, 2 days. Buried in Row 15 of the Ringgoldcemetery, Ringgold Twp., Jefferson County, PA.
She was also known as Eve Holben. She died on 6 September 1887 at age 73. She was buried at Jefferson, Pennsylvania, USA. Martha Mozelle Ewart was born in 1848 at Ohio, USA. Her married name was Toland. She married Nicholas St. Clair Toland M.D., son of Benjamin Toland and Martha Denbow, on 18 July 1889 at Knox, Ohio, USA.1 Martha Mozelle Ewart and Nicholas St. Clair Toland M.D. lived in 1900 at Martinsburg, Knox, Ohio, USA.2 Martha Mozelle Ewart died in 1934 at Knox, Ohio, USA. Maria Fadley was born in 1759. She was also known as Maria Custer. She died in 1799. Charles Feiber was born in 1880 at Ohio, USA.1 He married Cecil Denbow, daughter of Hamilton Denbow and Ellen Thompson, in 1900. John Feiber was born in 1880. 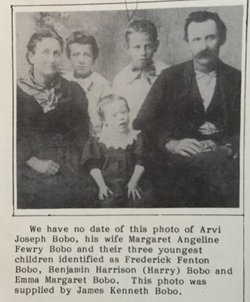 He married Columbia Isabelle Baker in 1900. 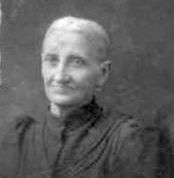 Anna Barbara Feilner was born on 25 November 1833 at Hermersdorf, Erlangen-Hochstadt, Bavaria, Germany; From German-language newspaper obit.2 She married Mathias Blum, son of Johann Bluhm and Hannah Weldi, on 29 July 1859 at Columbus, Franklin, Ohio, USA.3 Her married name was Blum. Anna Barbara Feilner died on 9 February 1904 at Columbus, Franklin, Ohio, USA, at age 70; German-language newspaper obit. James Ferguson was born in 1930. He died in 1980. Elizabeth Ferringer was also known as Elizabeth Himes. Amanda Fewry was born in 1833 at Virginia, USA. Elijah Fewry was born in 1827. He U. S. Census 1850, Ohio, Vinton County, Swan Township, Family192-193. James Fewry was born on 5 January 1791 at Virginia, USA. He died on 29 August 1867 at age 76. He was buried at Vinton, Ohio, USA. Sarah Fewry was born in 1837 at Virginia, USA. Susan Fewry was born in 1831 at Virginia, USA.